Prairie Farm is a replica turn-of-the century farm complete with barn, farmhouse, pond, pasture, & flower garden. Admission is free and the Farm is open to the general public from Memorial Day to early August and features a variety of your child’s favorite animals including cows, horses, sheep, pigs, goats, chickens, llamas, donkeys, miniature horses, peacocks, rabbits, turtles, turkey, and a beautifully established koi pond. Wandering paths and big shade trees make the farm a truly enjoyable destination all summer long. All Prairie Farm programs are weather dependent. For weather-related closures or other program delays or cancellations, please visit our Cancellations Page or call 217-805-4100 and press 5 for automated updates. 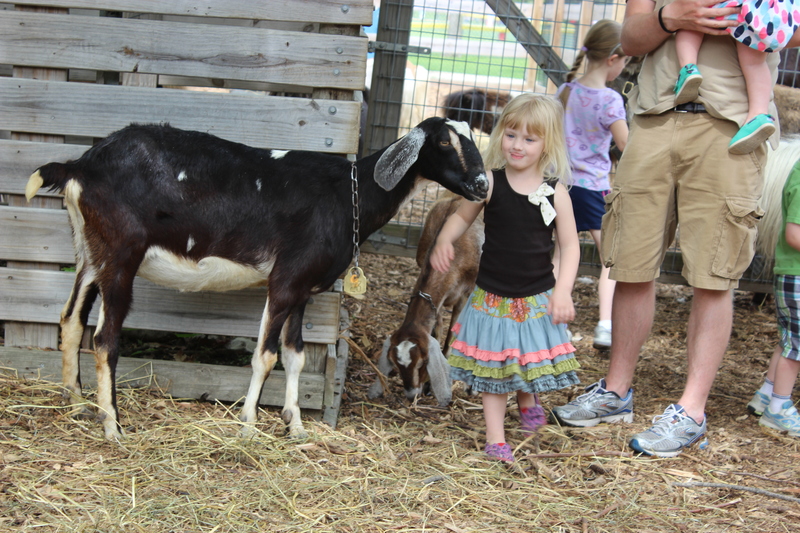 Bring your kids to check out our kids (baby goats) and other aspects of the farm. 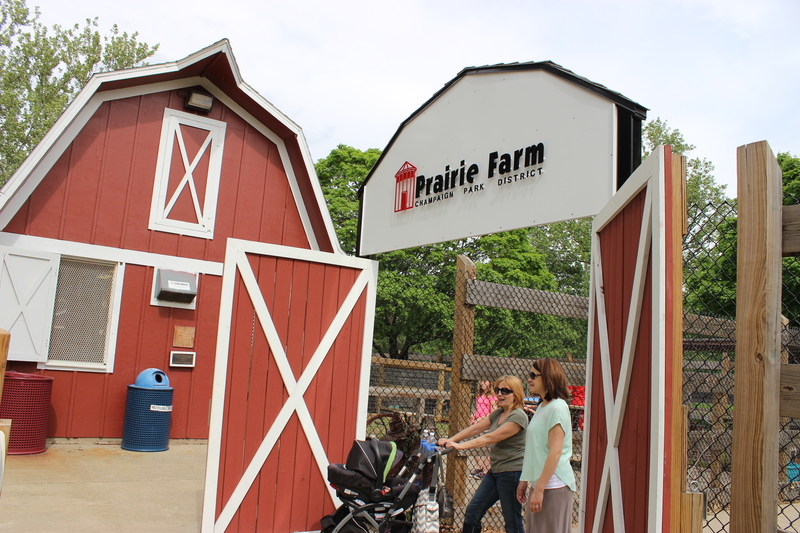 Educational tours of Prairie Farm are offered every morning, depending on availability. Tours are 45 minutes in length and include close contact with the animals. Schedule your tour at least three weeks in advance by calling 217-398-2583. Reservations begin booking April 2. Little Bo Peep has found her sheep – they’re at Prairie Farm waiting for you to come pet them! Lots of other animals anxiously await your arrival, also. 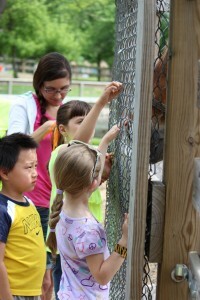 Petting animals is at your own risk, even though the area is supervised and the animals are tame. Please wear tennis shoes or boots to protect your feet from the dancing donkeys. 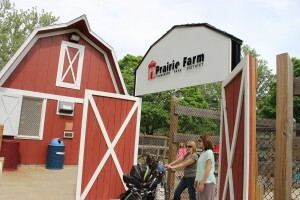 Once upon a time, the Prairie Farm animals hosted a story hour. 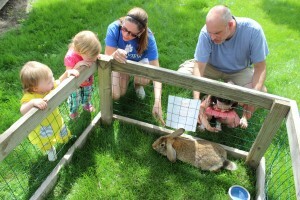 Children of all ages stopped by the farm to enjoy animal stories. Some children brought blankets and picnic baskets filled with goodies. Others just brought their smile, but they all lived happily ever after. plenty of contact with the animals, arts & crafts, games, and songs. Wear tennis shoes or boots if you want to enter the petting area, and get ready to ham it up! T-shirt included in fee. Select the class about your favorite animal or attend all the courses to become a real animal expert. Each class includes time for feeding and caring for the animal of the day, information about that animal, and a craft activity. Wear tennis shoes or boots to all classes – NO sandals, please. Here’s a program where horsin’ around and getting dirty is encouraged! Kids can develop an appreciation for animals and learn about their care through hands-on activities. A down-home, farm-friendly picnic for all Farmhands will wrap up the summer. Wear clothes that can get dirty and tennis shoes or boots and get ready to have some fun! Ages 4-5, Mondays: Geared toward pre-readers, with emphasis on animal appreciation and identification. Ages 6-7, Tuesdays: Emphasis is placed on animal welfare with more advanced crafts and activities. 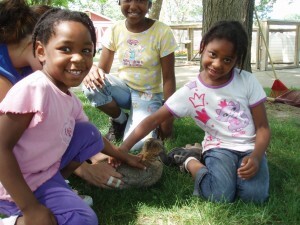 Ages 8-11, Wednesdays: Basic animal handling techniques are covered as well as an ongoing project. Hey diddle diddle, the cow jumped over the moon, and over the mud puddle, and over her shadow, and over that rock over there. They’re jumping for joy because they can’t wait to get to know you during Barnyard Fun Camp! 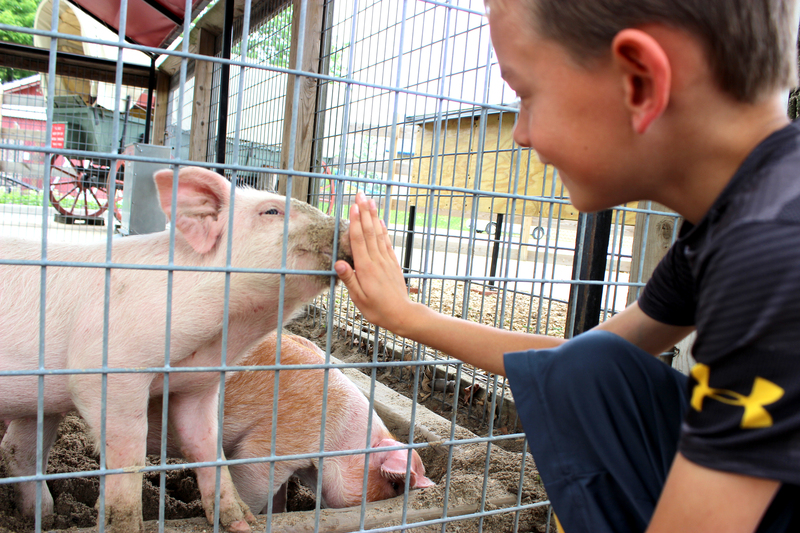 Through a variety of hands-on activities, campers will learn about the care and maintenance of the farm and animals. Crafts, games, a field trip, and plenty of time with the animals make this an eggs-traordinarily fun time! Fee includes a t-shirt. Be sure to wear tennis shoes or boots – no sandals, please. Have you ever wanted to raise a rooster, nurture a nanny goat or pamper a piglet? The Champaign Park District has made it possible for you to bring a new “addition” to your family! Become the proud parent of a Prairie Farm resident of your choice by enrolling in our Friends of the Farm program. Your home and yard will remain clean and goat-free, because your new addition will reside at Prairie Farm. Visit your adoptee all summer long, free of charge! Imagine the look on friends’ faces when you introduce them to the newest member of your family…a piglet! And it’s sow easy! For as little as $50, you, your family, or business can have the satisfaction of knowing that you are helping to provide for the welfare of your adopted animal. Your adoption money goes toward the feeding and health needs of all the animals at Prairie Farm. Become a Friend of the Farm today! Please call call 217-398-2583 for any questions, and take a look at our adoption packet!